Easy, Festive Caramelized Goat Cheese Salad with Walnuts - Oh, The Things We'll Make! 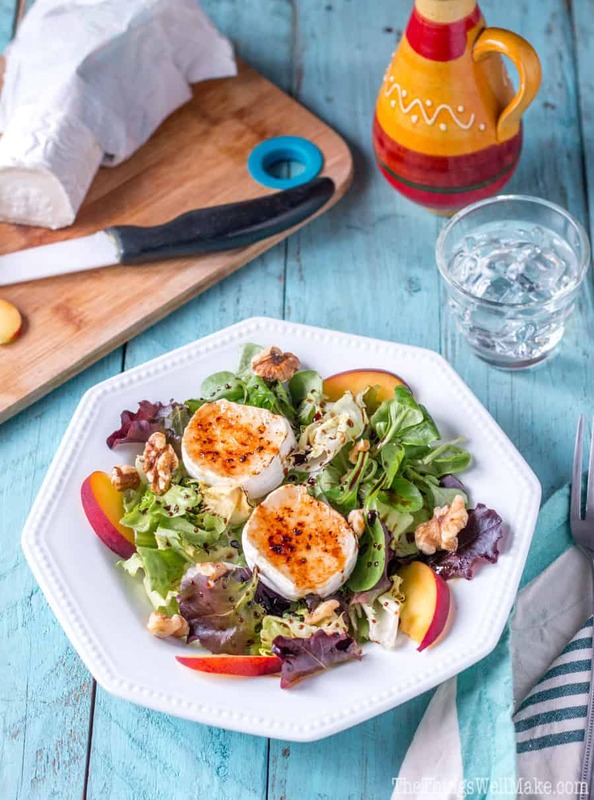 This easy, caramelized goat cheese salad with walnuts is elegant enough for festive get togethers, yet simple enough to make as an every day meal or side. The beginning of the year often brings New Years resolutions to be healthier. While some people are more than happy to eat healthier after having overdone it with holiday eating, others have a hard time giving up their holiday sweets and treats. I absolutely love this salad because it’s easy to whip up at the last minute, it’s festive and elegant enough for serving at a holiday get together, yet simple enough to make for yourself for dinner. You can leave it vegetarian, adding in fruits and other nuts and seeds as desired to customize it to suit your taste, or you can add in some slices of cooked chicken breast or tuna fish to make it more of a complete meal. You can caramelize the cheese by frying it in a skillet, or broiling it in your oven, but I find the simplest way to do it without having the cheese fall apart or stick to a pan is to use a kitchen torch. I bought one for making things like creme brulee and Crema Catalana, but I have to admit that I really pretty much only use it for making this salad, something that I do several times a week since it’s my favorite salad! I’ll warn you that this salad does use a bit of sugar to caramelize the goat cheese into something spectacular. That’s why I think it’s a great transition salad that doesn’t make you feel sad or deprived. It’s sweet, and fun, and makes you feel like you are eating something very special; because you are. Do I need to use sugar to caramelize the goat cheese? What salad dressing should be used? To add to the subtle sweetness of the salad, I like to drizzle it with a balsamic reduction and often add a few slices of fruit to it. The balsamic reduction adds a slightly sweet, slightly sour touch that when paired with olive oil, needs nothing more. I don’t miss sweet, thick, salad dressings when using it. Many balsamic reductions that you buy in the store have added sugar, but I find it’s sweet enough on its own. That’s why I make it myself whenever I run out again. It’s really simple to make, and adds the perfect touch to any salad. You can find my balsamic reduction recipe here. With Valentine’s Day coming up, I think it would be fun to add some bacon roses and strawberry hearts to make this salad perfect to suit the occasion. Don’t you? 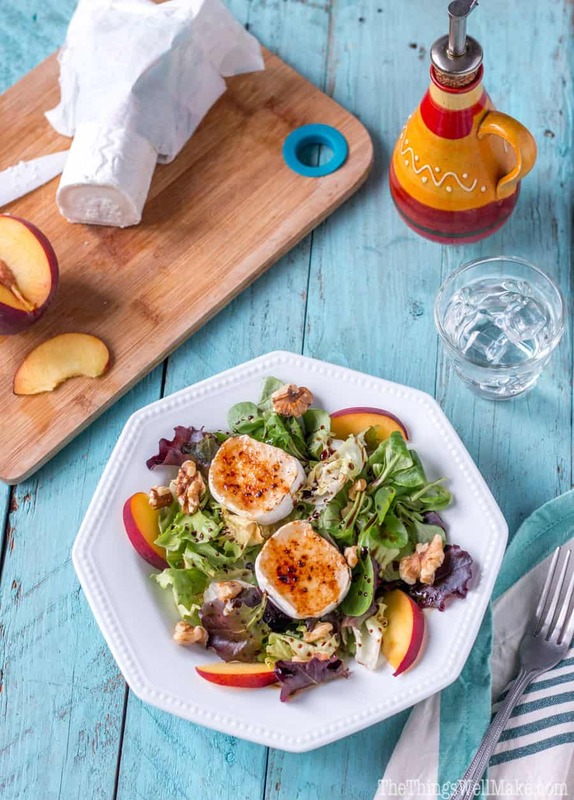 Are you Ready to learn how to make a Caramelized Goat Cheese Salad? Fill individual bowls with a mix of your favorite lettuce types. Drizzle it with the balsamic reduction and some olive oil. Slice the goat cheese log into slices and cover the tops with a thin layer of olive oil. Sprinkle the sugar of your choice in a thin layer over the oil, covering the top of each round of cheese. Using a kitchen torch, caramelize the sugar on the cheese slices. I keep the torch at a medium flame and hold it a couple of inches away from the cheese, waving the flame over it until the sugar melts and forms a thin, golden brown layer of candy coating. If you work very quickly, the cheese will stay more solid and cold. If you work slowly, you'll also slightly melt the cheese. I like going slow and melting the cheese, but that's a matter of preference. 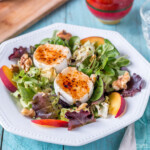 Sprinkle some walnuts over the top of the salad, and serve as is, or add slices of fruit, slices of chicken breast, and/or a mix of other seeds and nuts.